There's more to Robertson Quay than just the buzzing nightlife! Take it from us – aside from chilling with drinks, there are other fun activities you've got to try out! What comes to mind when you think of ‘Robertson Quay’? We know most of you haven’t heard much about the area beyond the buzzing nightlife. However, did you know that besides being a great place to chill with drinks, it’s also full of awesome activities and places to visit? Let us show you a Robertson Quay you never even knew existed. It’s situated in close proximity to Clarke Quay, so we’ve taken the liberty to combine both places at one shot. Here we go! The Book Cafe is a relaxing place where you can just while away the afternoon with a good book in hand, and a cup of freshly brewed coffee in the other! The indoor area resembles that of a living room, providing a casual and cozy atmosphere. With a wide array of books, magazines, foreign and local newspapers, as well as electrical power points for laptop users and free wireless connectivity, it’s a hotspot amongst students and professionals. Everything you need is right there – how incredibly convenient! In addition, all day breakfast, salads, soups, sandwiches, pastas, and more are available as well, so you won’t go hungry when studying or doing your work! Don’t they look absolutely delicious to you? Most of us have heard about Bungee Jumping for sure, but what about the Reverse Bungee? You’ll definitely have a wild ride screaming your heart out with this adrenaline-pumping activity! Besides, for those of you who have acrophobia – it’s also great that you don’t have to throw yourself off a platform that’s located miles above ground. Take it from us – this is a much easier option, with the same amount of exhilaration and excitement; the only difference is that you start from the ground level! We tried BOTH the reverse bungee and the extreme swing! Both of us were absolutely terrified but also very curious to find out how the experience would be like! Well… it was completely NERVE WRECKING. We literally screamed the entire time we were on the ride! Nevertheless, it was refreshing to have a bird’s eye view of the Singapore River and shophouses from up above! The entire experience was SO WORTH IT. We highly recommend everyone to try it at least once, it’ll definitely be an extremely memorable experience! We had such a fun time exploring the Meidi-ya supermarket! They had all sorts of Japanese products – fresh seafood, flavoured nuts, desserts and more. They also had different types of Japanese green tea that left us thoroughly spoilt for choice. We particularly loved the Pikachu cup noodles, it was simply too adorable to resist! We immediately grabbed about 5 cups off the shelf right on the spot. They also have a wide array of gummies, biscuits, and snacks that you won’t be able to find anywhere else besides Japanese specialty shops. Kirin Beer also came in small and compact sizes, perfect for parties or gatherings with friends! We were craving for sashimi and sushi for lunch, so boy were we glad to see that the supermarket sold a huge variety of them as well. They were really delicious and fresh! Stock up on all your favourites available right here. MEMO @ Studio M Hotel is a self-serve deli-by-day, and bar-by-night, and is perfect for a casual afternoon or for professionals to socialize with colleagues after work. Featuring mouth-watering waffles and delightful pastries, this is a cozy place to hang out with great company! We especially loved the bright interior and vibrant decor! Look at the colourful display of pastries and snacks around the cafe – you’ll be thoroughly spoilt for choice. Sit back, relax, and just chill over a good cup of coffee. Mmm, that sounds like pure bliss to me! 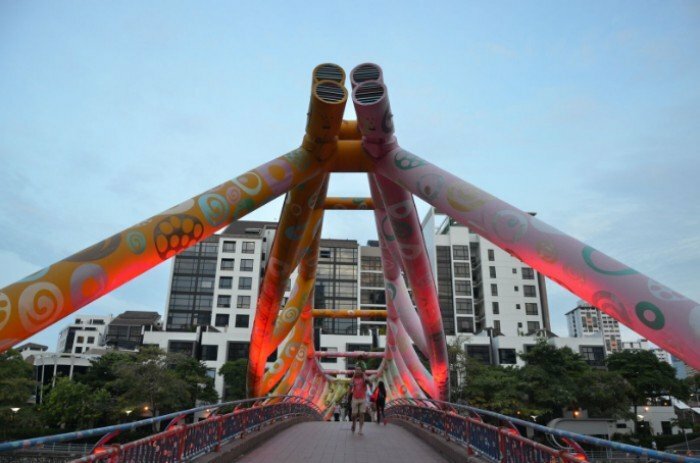 Did you know that this colourful bridge was a gift from Pacita Abad, a prominent Filipino artist? She conceptualized and conceived the idea to paint the Alkaff bridge with a kaleidoscope of shapes and colours. In the evening, the bridge is a beautiful sight to behold! Perfect for a relaxing stroll with your loved ones. Take this opportunity to snap some Insta-worthy photos as well! If you haven’t tried Turkish ice-cream before, you’re sorely missing out! We’ll let you in on a secret – getting your cone of ice-cream will be an unbelievably tough process. When you’re buying it from the salesman, be aware of all his tricks and nifty pranks. You can try to grab your ice-cream cone but you’ll never get it! Nevertheless… it will surely make your cone of ice-cream much more satisfying once he hands it over to you! Whip out your phones and get ready to record all the action – you’ll have a hard time controlling your laughter as you watch your friend helplessly try to grab their ice-cream cone. There’s a reason why Clarke Quay is so popular at night, and filled with couples and groups of friends sitting by the river on the steps. It becomes a tranquil place to just chill, relax and have fun – coupled with mesmerizing views of colourful lights reflected against the river. We loved the peaceful ambience by the waters, indulging in a scoop of delicious ice-cream while admiring the scenery right before our eyes. It felt as if all our worries just melted away! 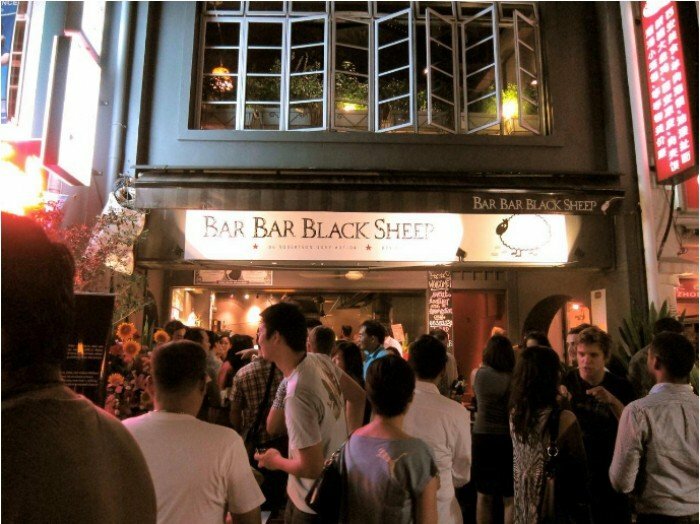 Aside from their unique name which reminds you of a particular nursery rhyme, Bar Bar Black Sheep is loved by many locals for its variety of multi-ethnic cuisines. You get to enjoy Thai, Western and North Indian food all under one roof! They also have many cocktails and craft beers at affordable prices. We indulged in a creamy bowl of butter chicken and a chargrilled mushroom and bacon cheeseburger. It was absolutely sinful yet oh-so-delicious! Dining by the riverfront was extremely refreshing and relaxing! We spent a languid hour just feasting on these delectable dishes, people-watching, gazing out into the river and waving to strangers on cruise boats that went by. You’ve got to grab your family and friends down here for an enjoyable night! Can’t get enough? Have a staycation at Studio M Hotel Singapore! With so many things to do and restaurants to try in the Robertson Quay/Clarke Quay area, one day just won’t be enough to cover them all! Why not treat yourself to a unique and indulgent LOFTcation at Studio M Hotel while you’re at it? You’ll definitely have a whale of a time in their cozy lofts, and be in the perfect place to explore the area better! The floor to ceiling windows make it INCREDIBLY difficult to leave the room at all! 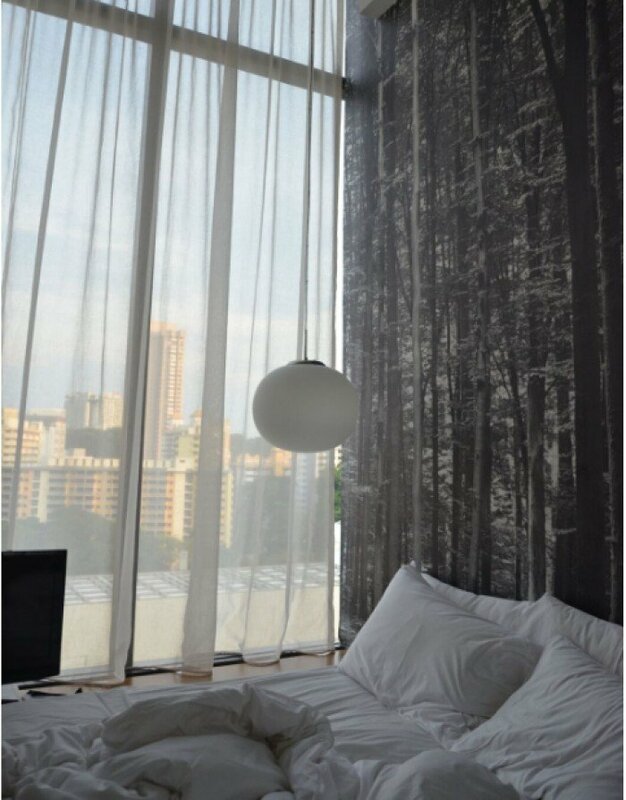 Be rewarded with amazing panoramic views of the Clarke Quay area the moment you roll out of bed. You’ll be amazed yet again in the evening, when the sun sets and the sky is awash with colours. We loved to simply lounge around the pool on one of these plush deck chairs! 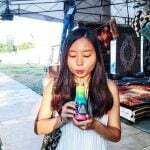 It was the perfect place to spend a relaxing afternoon, just poring over a good book and indulging in soothing, acoustic music. If the weather gets too hot, you can always jump into their 25 metre lap pool for a splashing good time! 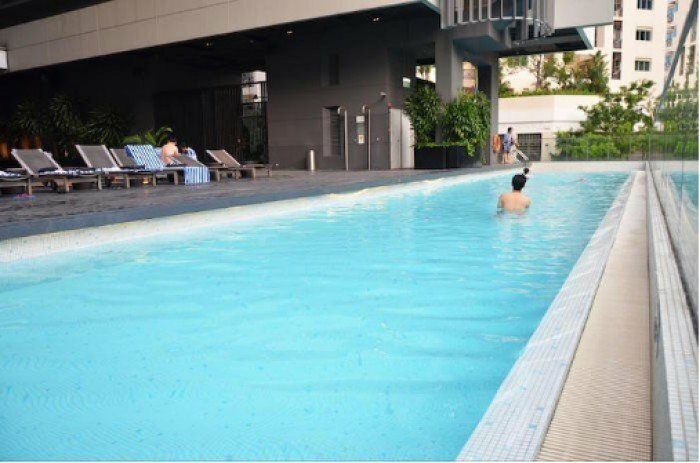 We felt super refreshed and invigorated after a good swim – it’s the best way to work out in this sweltering weather. Are you tempted yet? Explore the best food places and activities to do around the Robertson Quay area at a leisurely pace when you stay at Studio M Hotel. With such a convenient location, it doesn’t get any better than this!